Wolfhall – now there’s a name that I am sure you will be familiar with! It is a place steeped in myth and legend; but what of the real Wolfhall? The grand Tudor mansion, built by Jane Seymour’s father, Sir John, is essentially lost, but now an intrepid team of local historians, researchers and archaeologists is on a quest to reconstruct the lost hall so that each of us can enjoy what it might have looked like in all its early sixteenth century glory. Read on to find out more about Wolfhall, its history, and what the current excavations are revealing of the past. On a cold and drizzly day in October 2018, I drove down into Wiltshire, heading towards one of the most famous places associated with Tudor history – Wolfhall. Thanks to the eponymous book by Hilary Mantel, the location is now known across the world. And yet, it remains one of the most elusive – and enigmatic – buildings of the age. For there is virtually nothing left of the original mansion – mere fragments incorporated into the current farmhouse; there are no contemporary accounts of what the hall looked like, nor are there any surviving plans or drawings. Of course, Wolfhall’s infamy is largely due to its sixteenth century owners – the ambitious Seymour family and, in particular, Henry VIII’s third queen, Jane. Whilst we put little store by the legend that Henry VIII first laid eyes on Jane at Wolfhall during the historic summer progress of 1535, (Jane had been serving at court since around 1528), it is intriguing, nevertheless, to ponder on just what might have happened during the king’s week-long stay. Anne Boleyn was by Henry’s side, and contemporary accounts often refer to the king and queen being ‘merry’ during the progress. And yet, the fact remains that around nine months after that visit, Anne would be dead and Jane would be Queen of England. I had visited the site of Wolfhall before, for the research that Natalie Grueninger and I undertook for In the Footsteps of Anne Boleyn. At the time, I was not in a position to get any closer to what remained of the property than the nearby road that snakes its way through the farm buildings, but I do remember being moved by the vibe of the place; it felt that something of significance had once transpired there; I left feeling very reflective and now, around 5-6 years later, with some excitement, I was finally returning. Much had happened in the life of Wolfhall since I last visited – notably the surge of interest in the location following the publication of Mantel’s critically acclaimed novel, and the BBC dramatisation that followed, based upon the book. With a greatly renewed focus on the site, the owners of Wolfhall (who, by the way, are directly descended from the Seymours), and a group of passionate, local historians and archaeologists saw the opportunity to raise Wolfhall from the earth and reconstruct it in all its former glory. I was there to find out more about what they had uncovered thus far, around one year into the dig, and to hear about their long-term plans. And so I met Graham Bathe, an archival historian who has been studying the Savernake Forest for around 20 years. Before we delve into the archeology though, and what that has revealed so far, let’s remind ourselves of a little history. Here I recount some of my own research into Wolfhall, interwoven with Graham’s account, shared with me as we wandered together in the gardens that surround the current building. The Manor of Wulfhall, as appears from an old Survey, consisted at that time of about 1270 acres… About the house, which is said to have been timber-framed, there were several gardens, ‘the Great paled garden’, ‘My Old lady’s garden’ and ‘My Young Lady’s garden’. There was a Long Gallery, a Little court, a Broad chamber: and a Chapel. Sir John Seymour’s palatial home was constructed upon the site of a substantial, stone built medieval building and, indeed, it is possible that there had been some kind of settlement or manor house on the site reaching back much further in time. The Seymours were the ancestral wardens of the Savernake Forest, a vast territory which surrounded Wolfhall. Situated in the heart of the forest, by the time Jane’s father became Lord of the Manor in 1491, it was a medieval stone house, although it would be remodelled and upgraded in advance of the week-long, royal visit of 1535. John Leland, antiquary, who travelled through England in the late 1530s and early 1540s, describes it simply as a ‘beautiful mansion’ (‘villa splendida’). Wolfhall was a house with two or more courtyards (one known as the little court) set in a range of garden and orchards, barns and outbuildings. There was probably a gatehouse, as one of the gates had a garrett room above. There was a hall…kitchen, two galleries, a broad chamber, a great chamber with a chimney, the king’s chamber (reserved for royal visits), a chapel, treasury house, evidence room (presumably for deeds relating to the substantial landholding) and an armoury. He goes onto argue that for a house of this size and importance, there must also have been ‘substantial family rooms, sleeping and servants’ quarters, offices, washing facilities, laundry and service buildings’. Certainly, as we stand gazing upon what is clearly the oldest part of the surviving manor house, he tells me that the hall was once enormous and that the current building probably occupies only 5-10% of the footprint of the original manor house. 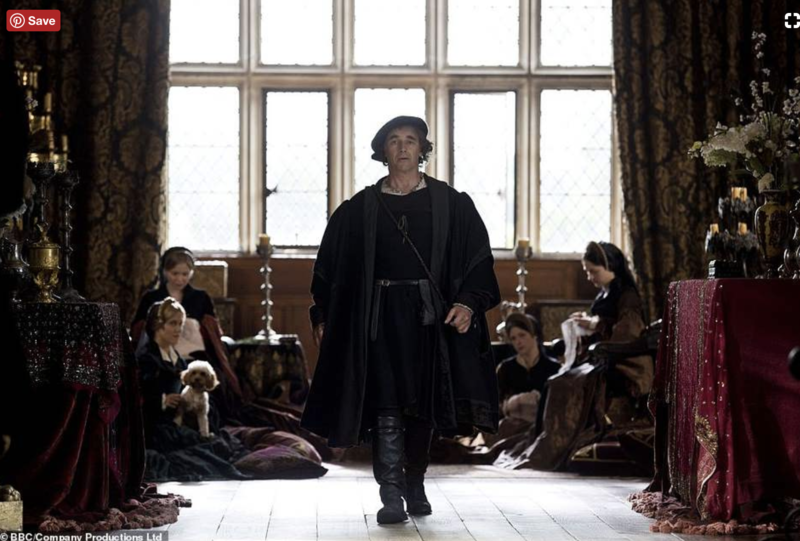 Of the events at Wolfhall, we know frustratingly little. Henry VIII visited the house in 1518, 1520, 1523 and 1526. However, these visits were brief, compared the one in 1535, when Anne Boleyn was at his side as queen. The king and court arrived at Wolfhall from nearby Bromham, home to Sir Edward Baynton, Anne Boleyn’s Lord Chamberlain, on 3 September. Nothing is known of the events which unfolded there, other than that on 7 September the king signed several important documents relating to the forthcoming consecration of three reformist bishops – Edward Fox, Hugh Latimer and John Hilsey. Then, on 10 September, Cromwell wrote a letter to Chapuys, passing on the king’s congratulations to the Emperor, Charles V for his apparent success in storming Tunis; however, he defers Chapuys’ request to visit the Lady Mary until his return to London. Ever the wily fox! Just 4 years later, Henry was to return. By this time, Sir John Seymour was dead and his eldest son, Edward, had inherited the estate. The king revisited Wolfhall again in 1539. (There would be two further visits in 1541 and 1543). An entry in Edward Seymour’s account book of that year suggests the barn may well have been used during the king’s visit – but for what, we know not. Maybe this was the source of the [incorrect] legend that the wedding of Henry and Jane had taken place in the barn – a case of historical Chinese whispers perhaps? The great Barn at Wolfhall, burnt down in the 1920s. Paid to Cornish the paynter for divers colours by him bought, for making certain frets & antiques on canvas for my Lord’s barn and house at Wulf Haull agains the king’s coming thether. 9th Aug. It seems canvas was to be hung in the barn, painted with fashionable antique-work patterns and in bright colours, simulating a high-status interior. The canvas palace erected at the Field of Cloth of Gold comes to mind. Accounts indicate that prior to Henry VIII’s first visit to Wolfhall in 1535, Sir John significantly remodelled the house to make it suitably grand for a royal visit. The team currently excavating on site believe that the medieval, stone house was in part, or completely, taken down and a more fashionable, timber-framed, red-brick house erected in its place, making a fine double-courtyard mansion. Large quantities of scaffolding were ordered to enable the work and, amazingly, post holes, probably used to ground the scaffolding, have recently been uncovered in the trenches on the south-east side of the house. The exact extent of this work, however, is unknown. And so by the time of the king’s visit, Sir John Seymour’s ‘beautiful mansion’ was complete and had reached its zenith. Incredibly though, within three decades the very same house was falling into ruin. By 1569 the house’s tower had ‘become ruinous’ and was pulled down. In 1672, a visitor to the area, John Aubrey, noted that a great part of it had already been demolished. But why? How did this come to pass? In short, the Seymours fell victim to their own ambitions; Sir John’s heir, Edward Seymour, Jane’s elder brother, became Lord Protector Somerset upon the death of Henry VIII in 1547. In the late 1530s, with the ascendency of Jane Seymour, the family’s burgeoning ambitions had caused the new Earl of Hertford to establish a base in London. He certainly was not going to mastermind the Seymour Empire from a Wiltshire backwater! And so began his building campaign in the city with the construction of the mighty Somerset House. This was the first blow to the fortunes of Wolfhall. However, worse was to come. In 1552, he succumbed to the axe on Tower Hill. As a result, the Seymour coffers were heavily depleted and, what is more, its natural heir, and lord of the manor, was absent for a prolonged period of time. As a result, the house fell into a perilous state of neglect. When Seymour was finally released and went back to Wolfhall, he wrote a letter saying it was “beyond repair”. Yet, rather than resurrecting his ancient ancestral home, he began a new building project, constructing a huge house at nearby Tottenham; some of the materials used to construct this new mansion were thought to have been taken from the original manor. The remaining house was greatly remodelled over time with first, Georgian and later, Victorian, extensions being built. What was left had been leased out as a farmhouse in the 1630s, and so ended the story of the great Wolfhall. My tour of Wolfhall started outside the western front of the building. Clearly, it is the oldest surviving part, with its black timber frame, infilled with red brick, dating back to the 1550s. However, any discernible Tudor remains have been radically reconfigured and no distinct rooms remain from the time in question. What the team knows currently about the house comes from pulling together Wolfhall’s building accounts, the archaeological finds, and the remarkably intact complex of underground sewers, which date back to Sir John’s Wolfhall. The oldest part of the house incorporating fragments surviving from the 1550s. He goes onto say, “There are also records of tiles coming off the ‘King’s Chamber’. This was almost certainly a suite of rooms, reserved for the use of the monarch.” Knowing what I know of royal lodgings, I enquired about the queen’s side, which surely must have complemented the king’s, as would usually be the case. “There may well have been, but as that side did not need repairing, we hear nothing of it! ” My juices are flowing, and I long for the lost house to just rise up out of the ground and answer my never-ending stream of unspoken questions. “The accounts show that there was a sudden explosion in building work in 1753, with the owners spending huge sums on brick-makers, plasterers, glaziers and so on. This is almost certainly when the Georgian building was being erected. However, our research has shown that there is almost certainly a Tudor building encased within.” He adds, “We know that the original house extended to a depth far exceeding that which we see today. Probably right out to here.” Graham points to the boundary wall of the garden, some 20m out from the current facade of the house. One can only begin to imagine what has been lost and now lies beneath the emerald lawn. With that, we continue to move around the outside of the house to the east side and look down into the first set of trenches dug out in 2017. Clearly evident is a pavement made of thick, stone tiles, which runs away from the house in an easterly direction. Graham explains that the route leads toward where an archway once stood (this had been captured in earlier times on a photograph and was not Tudor). Did this archway stand upon an earlier one or a garret house? Did the main road come up from Savernake by The Laundry (a building that stands to the north of the site and which was built by Edward Seymour, Jane Seymour’s nephew) and then on to the archway, the main entrance to the house? Sadly, we still don’t know. He then pointed out the site of the old, Great Barn lying to the southeast of where we were standing, some 100 metres away. This barn is the stuff of legend, as I have already described. It miraculously survived to the 1920s, but sadly burnt down leaving nothing remaining. At this point our attention turns back to the trench and Graham explains both the importance of the Tudor, brick sewers as ‘artefacts’ in themselves, as well as their role in helping make sense of the orientation of the original building. The sewers are probably unique; the team think that there is nothing like them in the country. They could be the most important survivor of the site. There are around 140 yards still existing and they are laid in a network. As Graham says, they are “incredibly sophisticated”. As I would later find out, once I went down into the sewers to see them for myself, the chutes dropping down from the original garderobes still exist. As these would have been positioned on the outside of the building, these chutes help identify where the outer walls would have once been. It was whilst following the route of one of the tunnels running in a north easterly direction that the team found the foundations of a wall going off at an angle of 120 degrees. This was intriguing, as its direction was out of kilter with the north-south-east-west orientation of the building. In effect, what they had uncovered was a large hexagonal tower; maybe the tower mentioned in the building accounts? There was great hope that another could be found on the other side of the pavement, creating a symmetrical feature. However, sadly, nothing was uncovered. Yet all was not lost! As we move over towards the corner of the garden to explore the latest set of trenches, Graham stops to pick up a pearly-white shell. Holding it for me to see in the palm of his hand, he tells me how the kitchen accounts show that the Seymours were importing around 500 oysters a week from Fish Street in London to consume at the table; hundreds, if not thousands of them have been unearthed as the trenches have been dug; a little insight into life at Wolfhall! Once we had made our way over to the most recent set of trenches, my guide showed me the outline of a narrow Tudor room with a large hearth, and in the corner a fragment of a brown and gold glazed tile. Wow! How this floor would have once looked! Nearby, in another trench, the team had uncovered an angular foundation that looks to belong to either a second hexagonal tower, or possibly a very large, bay window. In either case, it is an impressive structure and conjures up so much in the imagination. There is still much to do at Wolfhall. The final goal, to reconstruct the Tudor palace as it was in its hey-day, is some way off. The project currently has a 5-year time-span, although there is the chance this can be shortened depending on the flow of cash into the project. One way to support the project and ensure that the team reach their final goal is to become a “Friend of Wolfhall’ and you can do so by following this link. Wolfhall, the legendary scene for Henry’s ‘nouvelle amour’ with Jane Seymour has surely now been immortalised by the book of the same name. Yet, long before this, a group of passionate local historians, of which Graham is one, have kept the flame of its memory alight. Now there is the chance to raise Wolfhall once more from the earth, at least in our imagination, thanks to their tireless efforts to uncover this once great, lost Tudor manor house. Important Note: Please remember that Wolfhall is a private family home, and the site cannot be accessed by the general public. If you have any queries, do contact the Chair of The Friends of Wolfhall, Dee Atkinson at deeatkinson1960@icloud.com. Then look no further! Subscribe to the blog and you will receive a download link to receive your FREE mini travel guide, A Tudor Weekend Away…in Kent, as a ‘thank you’ for joining The Tudor Travel Guide community. This mini guide contains a weekend itinerary in Kent, the so-called ‘Garden of England’, packed with information for the Tudor enthusiast on three properties all linked to the Boleyn family; Pashley Manor, Hever Castle and Penshurst Place; an historic walk that links Hever with Penshurst, and two accommodation recommendations; one luxury, one luxury for less. Click on the ‘subscribe now’ button below and get your copy of the mini-guide. Start planning your next Tudor road trip! Enthusiastically written leaving the reader wanting for more. Thank you!